Small hive beetles (SHBs) are parasites of social bee colonies endemic to sub-Saharan Africa and have become a widespread invasive species. In the new ranges, SHBs can cause damage to apiculture and wild bees. Although the further spread seems inevitable, eradication of new introductions and containment of established ones are nevertheless urgently required to slow down the invasion speed until better mitigation options are available. However, at present there is no adequate action plan at hand. Here, we propose to take advantage of SHB invasion history and biology to enrol a feasible plan involving all stakeholders. Raising awareness, education and motivation of stakeholders (incl. adequate and timely compensation of beekeepers) is essential for success. Moreover, sentinel apiaries are recommended in areas at risk, because early detection is crucial for the success of eradication efforts. Given that introductions are detected early, SHB eradication is recommended, incl. destruction of all infested apiaries, installation of sentinel colonies to lure escaped SHBs and a ban on migratory beekeeping. If wild perennial social bee colonies are infested, eradication programs are condemned to fail and a strategic switch to a containment strategy is recommended. Containment includes adequate integrated pest management and a strict ban on migratory beekeeping. Despite considerable gaps in our knowledge of SHBs, the proposed action plan will help stakeholders to slow down the global spread of SHBs. Biological invasions typically follow a jump-dispersal pattern (Canning-Clode 2015) and eradication of recent introductions combined with containment of established ones have been proven as a means to slow down the global spread for a number of species (e.g. Campbell and Donlan 2005; Boser et al. 2017). 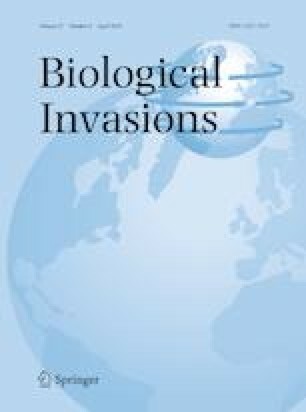 Efficient approaches for both eradication and containment require measures based on the biology of the invasive species in question, the local situation as well as adequate stakeholder involvement (Anonymous Editorial 2017). Here, we focus on the small hive beetle (SHB), Aethina tumida (Coleoptera: Nitidulidae). This beetle has originally been described as a parasite and scavenger of honeybee colonies native to sub-Saharan Africa (Lundie 1940). In 1996, it emerged as an invasive species, which has now reached all continents except Antarctica (Neumann et al. 2016; DePaz 2017; Lee et al. 2017). The spread of SHBs is ongoing, as evidenced by a number of recent introductions (2014: Italy, Brazil; 2015: Philippines; 2017: Belize, Canada, South Korea; 2018: Mauritius; cf. Neumann et al. 2016; Lee et al. 2017; DePaz 2017; Sturgeon 2017; Muli et al. 2018). Outside of its endemic range, SHBs can cause severe damage to apiculture as well as wild honeybee colonies and may also endanger other social bees serving as alternative hosts (bumblebees: Spiewok and Neumann 2006; Hoffmann et al. 2008; stingless bees: Halcroft et al. 2008, 2011; Mutsaers 2006; Peña et al. 2014; Greco et al. 2010; Wade 2012). Accordingly, a range of pest mitigation measures has been developed, but at present SHB diagnosis and control are not sufficient (Neumann et al. 2016). In particular, control outside of managed apiaries is not available yet, which is urgently required to limit the impact of SHBs on wild bees. Thus, there is an urgent and apparent need to slow down the continuing global spread of SHBs until better mitigation methods are available. However, at present, there is no international strategy for SHBs. Therefore, we here propose a best-practice action plan for A. tumida invasions (Fig. 1). A science-based approach should be taken to raise stakeholder awareness of all relevant impacts of SHBs on managed and wild social bees (Table 1). All stakeholders should be aware that anytime SHBs might arrive in their country or region. Therefore, it is important to take adequate actions (Table 1), before new introductions occur. All stakeholders should be provided with information on how to access tools and guidelines that enable recognition of new infestations. However, stakeholders may value the costs of invasive species differently according to their business (Simberloff 2003). Moreover, the degree of stakeholder engagement varies between countries due to resource constraints (finances, knowledge, etc.) possibly leading to a weakest link scenario (Stokes et al. 2006). Nevertheless, success is only possible if stakeholders agree and share a common view on the planned measures and respective consequences on their businesses and apiculture in general. Stakeholders, in particular beekeepers, should regard integrated pest management (IPM) of SHBs, incl. adjusted management and adequate sanitation of apiaries and other apicultural facilities (Hood 2011; Neumann et al. 2016). In particular, adequate and fast compensation for beekeepers appears to be central for success. How and what should be implemented? Evidence strongly suggests that only if a new introduction of SHBs is detected early, eradication can be successful (Neumann et al. 2016; Mutinelli 2016). In the USA, the first unidentified SHB specimens were collected in November 1996 (Neumann and Elzen 2004), but it took 2 years until A. tumida was officially confirmed (Hood 2000). By then, SHBs were already well established and widespread (Neumann and Elzen 2004), rendering an eradication impossible. The same holds true for the introduction of SHBs into Australia (Neumann and Elzen 2004). Border control and quarantine measures within a suitable legal framework are clearly the first line of defence against SHB invasion and should be implemented by every country. Moreover, all stakeholders should be able to recognize A. tumida infestations via adult and larval morphology as well as clinical signs at the colony level (Neumann et al. 2016). In particular, beekeepers should be cognizant during their routine practice and apiary inspections. Competent laboratories are required to confirm or reject suspicion by beekeepers. This holds especially true for eggs and larvae, which cannot be assigned to A. tumida based on morphometrics alone (Neumann et al. 2016). Any apiary under suspicion should be taken under strict and immediate sanitary restrictions and all movements of bees (colonies and queens), bee products and used bee equipment, into and out of such apiaries must be banned until the competent authority has investigated the case. At present, neither pheromones nor host kairomones have been identified for host finding SHBs yet. Therefore, the only known efficient attractants for adult SHBs are functional honeybee colonies. To be able to identify the pest early and to investigate a new outbreak in detail, it is therefore recommended to install sentinel apiaries, which consist of fully functional queenright honeybee colonies, to attract and trap SHBs in zones at risk for new introductions (Chauzat et al. 2016; Mutinelli 2016; Keeling et al. 2017). Such sentinel apiaries enable a cheaper and more efficient monitoring compared to active surveillance of hobby or commercial apiaries (Rivera-Gomis et al. 2017). Respective sentinel hives should be composed of one hive-box only with fewer frames than actually fit, to foster efficient and quick diagnosis. The hives should also be equipped with SHB traps that can be quickly checked (reviewed by Neumann et al. 2016). Inspectors are advised to regularly scale down these colonies by replacing brood frames with empty ones and to visit the hives at least every two weeks when local weather conditions foster SHB pupation (reviewed by Neumann et al. 2016). Surveillance in temperate and subtropical zones should therefore be reinforced from spring to autumn and all year long in tropical zones. During winter in temperate climates those traps should be preferentially used that allow monitoring but limit disturbance of the colonies (Neumann et al. 2016). Official confirmation of infestation with A. tumida should be given, if the competent authority identifies SHB eggs, larvae, pupae or adults. Then, a protection zone should be installed immediately to limit further spread, including a strict ban on movements of bees and beekeeping equipment, because migratory beekeeping poses the highest risk of spreading A. tumida (Neumann and Elzen 2004). The ban on movement requires an appropriate and permanent official control system to ensure application and compliance as well as traceability. The protection zone should be large enough to detect all possible natural spread, but small enough to be manageable with the local human resources available. As the maximum flight range of adult SHBs is still unknown, it is obviously impossible to define a safe distance. However, since all apiaries and beekeeping facilities (including abandoned ones) in the protection zone have to be investigated as quickly as possible and will potentially be placed under permanent restrictions, the size of the protection zone should initially be rather small (~ 10 km radius). It can subsequently be enlarged if required by the population status (e.g. when infested colonies are confirmed outside of the initial zone). In order to enhance chances of detecting new infestations, visual diagnosis should only be performed by trained staff (Spiewok et al. 2007; Neumann et al. 2013; OIE 2017b), effective traps should be installed (cf. Neumann et al. 2016), and hive debris samples, workers or other hive matrices should be investigated with specific DNA diagnostics (Ward et al. 2007; Ouessou Idrissou et al. 2018). To ensure that the locations of all beekeeping facilities inside the protection zone are known, every local beekeeper should be obliged to register and to update the competent authority about apiaries (in operation or not), honey houses, storage rooms and beeswax rendering or royal jelly plants. It is apparent that registration and control of movements might at present be unmanageable in some countries. Respective legislation and law enforcement is therefore recommended. It is further recommended to establish a surveillance zone surrounding the protection zone, in which sentinel apiaries should be implemented (see above), movements of hives be registered and all apiaries sampled to detect any further spread as soon as possible (Chauzat et al. 2016; Granato et al. 2017). 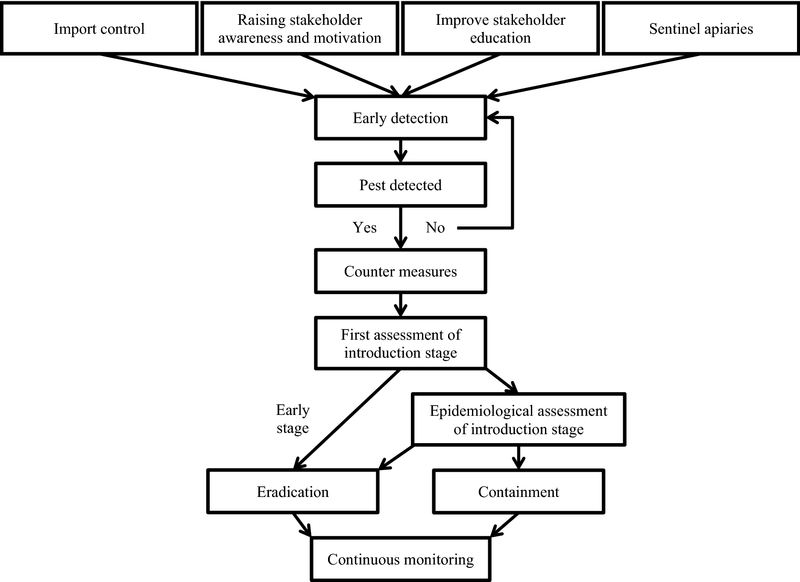 In conclusion, a combination of sentinel sites as well as highly motivated (adequately compensated) and well-educated beekeepers appears to be the optimal approach fostering early SHB detection. The population status of every new SHB case should be investigated as soon as possible and the potential economic and environmental consequences should be evaluated, before starting an eradication process. These investigations are indispensable, as it seems to be possible to eradicate SHBs only if a new introduction is recognized early and the spread is still limited to a manageable area. Apicultural trade and migratory beekeeping activities, abandoned or not registered apiaries, commercial bumblebee hives as well as possible infestations of wild host populations must be considered (e.g. in Australia, feral honeybee nests in trees were inspected, cf. Neumann et al. 2016). As soon as wild social bees with perennial colonies (i.e. Apis spp.) are infested, eradication seems impossible, as such colonies might host SHBs over several years and cannot be entirely discovered. Likewise, unsuccessful eradication measures of managed apiaries over two seasons strongly suggest reservoirs outside of the reach of control. Then, it appears prudent to switch from eradication to containment. Given that the introduction of SHBs appears to be early and infestations are still localized in a few managed apiaries, then it appears worthwhile starting eradication. Examples for successful eradications have been Perth, Australia and Sicily, Italy (cf. Neumann et al. 2016; Mutinelli 2016). Most important is that eradication must begin as soon as the population status is sufficiently clear. Every day counts as adult SHBs may disperse into the wild bee populations, thereby escaping eradication. It is mandatory to stamp out all colonies of the SHB-infested apiaries as soon as possible, because false negative diagnostics are especially likely in case of low infestation levels. For eradication, the entrances of all colonies should be sealed in the early afternoon (before the peak flight activity of adult SHBs, Neumann et al. 2016). Then, the bees should be killed (e.g. with sulphur dioxide) and all the material destroyed (e.g. burning) without any delay under the supervision of the competent authorities (Mutinelli et al. 2014; Mutinelli 2016). The soil surrounding SHB-infested colonies poses the risk of reinfection due to SHB-pupation and should be treated adequately (Hood 2000, 2011; Mutinelli et al. 2014; Neumann et al. 2016). Continuous monitoring has to be considered and sentinel colonies must be installed before all colonies of an infested apiary are destroyed, as a considerable number of adult SHBs may stay outside of hives (Annand 2011). These sentinel colonies in situ will attract free-flying SHBs that may have survived the local eradication effort. Even though SHBs are able to reproduce on fruits and other food in the laboratory and in semi-field assays (Buchholz et al. 2008), field surveys so far were not able to confirm any association of SHBs with alternative food sources outside of social bee colonies (Mutinelli et al. 2015; Mutinelli and Maroni Ponti 2017; Willcox et al. 2017). It appears most effective to focus on control measures for well-known major routes for SHB transmission and reproduction (cf. Neumann et al. 2016). In the case of eradication, any movement of managed bees into and out of the protection zone must be prohibited at all costs. Costs for stakeholders due to inadequate pollination should be covered by the competent authority. If one makes the decision to eradicate, one must be very strict to be successful. If one weakens the restrictions, the potential for further spread of SHB rises in the area, which increases the possibility for SHB to establish outside of managed beekeeping, making eradication impossible. For the 5 years following the last report of the presence of A. tumida an annual survey, supervised by a competent authority, should be carried out on a representative sample of apiaries in the concerned country or zone, and no signs of the presence of A. tumida should be detected. Only if this condition is met, the free status as a result of an eradication program can be recognized (OIE 2017a). To enhance chances of eradication success, substantial efforts should be made to ensure that all stakeholders work closely together and communicate necessary measures clearly and on a fair base. In particular, adequate and timely compensation of beekeepers is highly recommended. It must be prevented that beekeepers feel forced to handle the problem by themselves, in view of substantial financial losses. If eradication is not an option anymore, SHB containment must be applied to limit further spread. Protection zones have to be established (see above) and inside these zones, measures have to be applied to limit SHB reproduction, especially destructive mass reproduction (Neumann et al. 2016). The measures should include the use of in-hive traps (Neumann and Hoffmann 2008; Bernier et al. 2015; Levot et al. 2015), a beekeeping management that is adapted to the presence of SHB, incl. adequate sanitation of apiaries and other apicultural facilities (Hood 2011; Neumann et al. 2016) and the treatment of the surrounding soil, if damage by SHB larvae or other clear signs (i.e. slime traces of wandering larvae) have been observed inside the colonies (Neumann et al. 2016). However, it is indispensable that stakeholders have legitimate access to products for SHB pest treatment (e.g. medication in hives and/or adequate soil drenching products; reviewed by Neumann et al. 2016). Most unfortunately, no such products are currently available in the EU. Furthermore, implications for declaring SHBs established in a region/country should be considered, particularly the possible impact on international commercial movement (i.e. restrictions, ban, etc.) of honeybees, bee equipment and bee products. There is an obvious and urgent demand for more research to improve contingency planning due to considerable gaps in our knowledge of SHBs (Neumann et al. 2016). For example, an optimal approach would be efficient SHB traps outside of managed apiaries, which would safeguard bumblebees, stingless bees as well as feral honeybees. Basic research is required on the general biology of A. tumida to foster improved diagnosis, control and prevention, incl. anatomy, behaviour, physiology as well as on pheromones and kairomones governing SHB host finding. Finally, sentinel apiaries and the various SHB-traps should be assessed for their effectiveness and efficiency. Successful eradication is only possible if new introductions are detected very early, before SHBs infest wild social bee populations. Motivation and education of stakeholders (especially beekeepers) is crucial for success (detection, eradication and containment), which requires early response capacity and continuity of resources (financial and human recources). Adequate border control and sentinel sites are fundamental for early detection and success. After epidemiological investigations, the competent authorities have to decide between eradication or containment based on a cost–benefit analysis. Sentinel colonies have to be installed at outbreak apiaries to lure free-flying SHBs that might have escaped eradication. Irrespective of eradication or containment strategy, a surveillance system should be activated and maintained. Movement restriction and/or ban of honeybees and beekeeping equipment in protection and/or surveillance zone requires the activation of an appropriate and permanent official system of registration and control (traceability should also be guaranteed). A legal basis for appropriate actions of the competent authorities is needed (e.g. adoption of restrictive measures, destruction of apiaries, compensation after stamping out). There is a need for effective and scientifically based tools for training, detection/diagnosis, control and management intended for the beekeepers, bee-inspectors, veterinarians and other responsible entities. The gaps in basic knowledge of A. tumida biology currently limit the effectiveness of SHB contingency planning. We acknowledge the COLOSS (prevention of honey bee COlony LOSSes) association for promoting this joint publication, Lars Straub and Angela Minnameyer for language editing and the Ricola Foundation Nature and Culture for financial support.